This past weekend may have been my most crafty to date. And even if that may not be totally true, you probably can’t prove it — because do they make crafty weekend meters now? I don’t think so. Friday night, pals Becky and Aitor made their way to my doorstep. I had some last-minute prepping for the two shows we were taking part in, so we stayed up late chatting and doing the prepping. 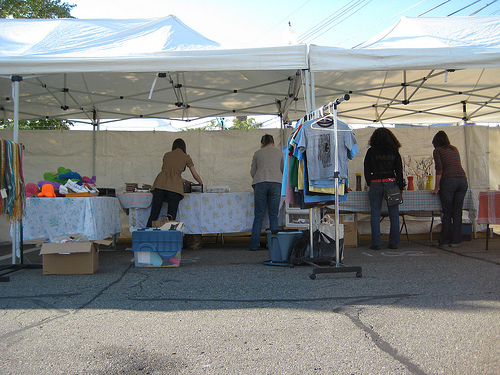 On Saturday I woke up early to help set up the Handmade Detroit tent at DIY Street Fair in Ferndale. HD had a really nice double space right next to the info booth. 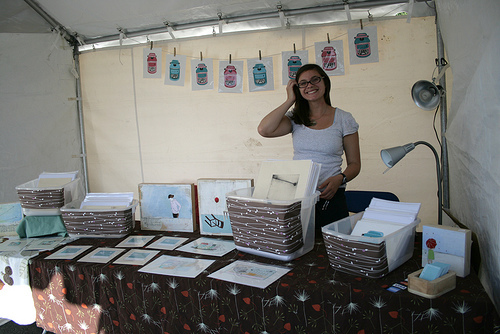 Our tent had many artists — and in true DIY spirit, we all split the vendor fee and took turns running our booth. Our maker helpers were awesome — every time I turned around Saturday, things were running smoother than Billy Dee Williams. 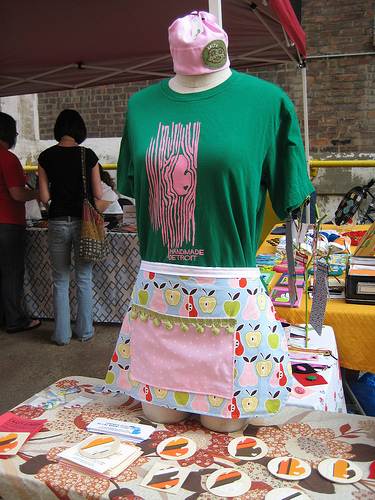 I chatted with a bunch of crafty buddies, including Emily and Andy from City Bird, and was maybe too excited to meet Michele Maule. I stole this picture off Michele’s Flickr so you can see how cute her booth looked. It was awesome to see all of the local people who create thoughtful and passionate art showing each other the thoughful and passionate art they create. It was awesome to see two groups of local creators — musicians and artists — coming together to celebrate their spirit. It was awesome to meet more than a few of my neighbors and friends of neighbors, even two friends of a potential neighbor — the sense of community that the festival created was inspiring. It was just awesome. Becky took these pictures of the fair (and Detroit) and there more photos tagged DIY Ferndale on Flickr. On Sunday, it was time to hit up another big art festival with a “Do Your Thing” attitude – this time the People’s Art Festival at the Russell Industrial Center in Detroit. The place was packed by the time I got there in the afternoon. 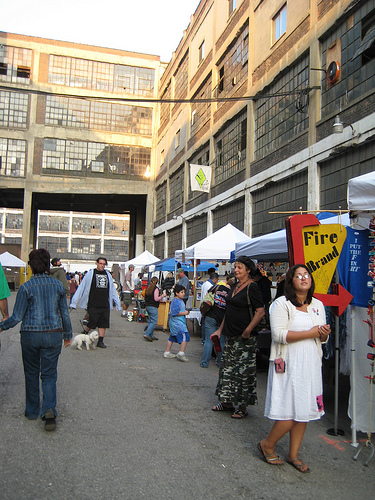 People were wandering every which way in and out of the studios, artist tents and the newly-launched Russell Bazaar. This is only year two for PAF — but the amount of new studios and ventures to check out this year was insane! It really goes to show that Detroit is hungry for these kinds of developments. If you haven’t been yet, why not catch a flick at the Motor City Movie House? 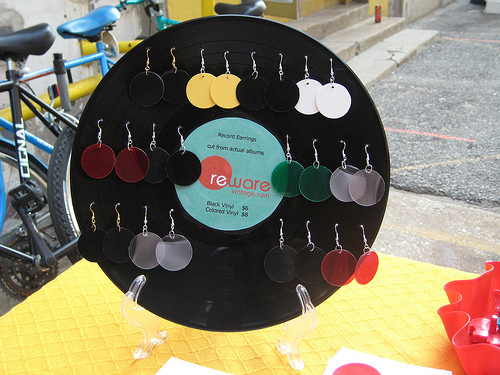 Or join Handmade Detroit at the space on Thursday at a new installment of the Model D speaker series. The topic this month is how Detroit can help creative businesses thrive and bring creative people together. Check out Bethany’s photos of DIY and PAF, who took this post’s photos. And thanks to everyone who helped out this weekend — it was a full one for sure! Thanks to everyone for their hard work, sharing shifts and making awesome stuff! Bethany: that may be the greatest display i’ve ever seen. i love handmade detroit. okay? 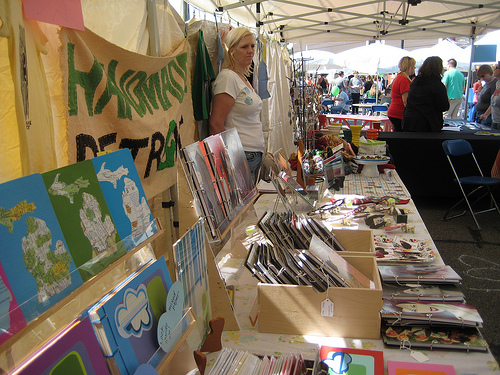 This was seriously one of the best craft weekends ever in the D! EVER!!! Thanks you guys. i just have to know what the fabric is in the pic with the lady sitting at the table, it on the cushion with the white background!!!! 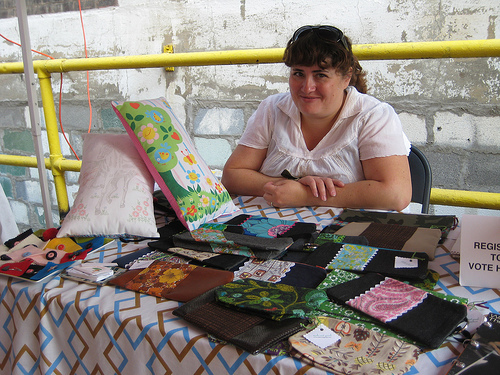 Chantal — I’m pretty sure that’s a vintage fabric! Thanks to all, it was amazing!